Humanitarian, pacifist, and tireless advocate for social reform, Jeannette Rankin was the first woman elected to U.S. Congress, and the only member of Congress to vote against U.S. entry into both world wars. 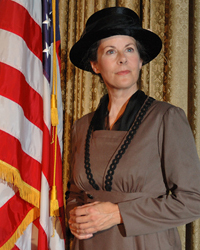 Hear about her journey from grass roots suffragist to being the first woman to participate in United State government. Hear in her own words her views on equality and government reform - words that ring true today. "You can take people as far as they will go, but you cannot take them as far as you would like them to go."